Are you one of the 77 percent of Singaporeans who regularly waste food at home, according to the National Environment Agency? If so, it’s not too late to make haste in reducing waste! A fridge that helps you manage both fresh produce and leftovers is a valuable kitchen assistant – it saves time, money and effort, and enables your household to be both a green and responsible member of the community by minimising waste. The Electrolux NutriFresh™ range features the Market Fresh Crisper humidity control function that keeps vegetables and fruits in optimum conditions for longer. Combined with the patented NutriLight™ technology, light is distributed evenly around the crisper to enhance your produce’s vitamin content so you no longer have to make as many trips to the grocery store! 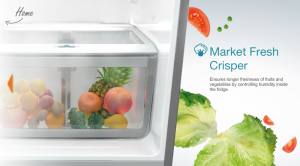 According to Urban Wählby, Electrolux Food Preservation researcher, this unique fixed wave treatment encourages synthetic photosynthesis in the NutriFresh crisper, which adds nutrients and energy back into fruits and vegetables – especially so with leafy greens with their larger surface ratios. In addition, its Multi Flow System, a cooling system that ensures constant air circulation through both refrigerator and freezer, eliminates the risk of unnoticed warm spots that may lead to quicker and unexpected spoilage. Outside of the kitchen, do your part to minimize food waste by supporting the Electrolux #HappyPlateSG movement in Singapore. From now till 22 November 2015, simply snap a shot of your empty plate, then Instagram it or upload your picture via HappyPlate.sg. For every three #HappyPlateSG hashtags, Electrolux will donate a Happy Food Bundle to a family in need, via the Food Bank Singapore.